Lindsey Jordan has been blessed with prolonged buzz around Snail Mail's 2016 EP Habit, and their forthcoming debut for Matador Records. Yet, as she criss-crosses the continent, honing her three-piece band, she's no doubt been confronted with the rash of expectations that come with being tipped at the Next Big Thing. It's a double-edged sword that would challenge even the most seasoned road warrior, let alone a teenager less than a year out of high school. Tourmates Lomelda, on the other hand, were relatively free from such expectations. The brainchild of singer-guitarist Hannah Read, the Texas trio performed a short set of quietly transcendental tunes that mixed Read's subtle playing with electronic flourishes. Yet the band's powerful songs were juxtaposed against Read's shy onstage demeanor; between songs the din coming from the back of the venue competed for the spotlight. Nevertheless, Read did recount the vigorous search their Prius took at the border and expressed her extreme gratitude for the crowd's attention before asking for a floor on which "three quiet people" could sleep. If Jordan is feeling any of the pressure that comes with a steady stream of profiles and plaudits, she certainly wasn't showing it. Unfazed by the packed crowd and a rough onstage sound mix, the trio worked through crowd favourites from Habit as well as a number of new songs. The latter hewed close to the sound of the former, though the arrangements felt tighter and more concise, boding well for fans hoping for more of the band's mix of gen x riffs and millennial emotional malaise. Jordan's vocals were perhaps the sole weak point of the night. Though off-key, they fit well with the band's loose aesthetic. She seemed far more comfortable jamming out with bassist Alex Bass, and even briefly feigned some rock star posturing, standing on drummer Ray Brown's bass while raising her guitar to the ceiling. "Thinning" predictably received the biggest reaction from the crowd, though Jordan introduced it as a troubled number that the band spent weeks working out in the studio. "A musician's story is never finished," she joked. "This one really took it out of us." Further proving that the group has a sense of humour, they offered a cover of Semisonic's "Closing Time," complete with garbled verses and Jordan singing the track's solo. Regardless of audience members' feelings about the band going in, Jordan and company succeeded in re-establishing the band's narrative. They're neither indie rock's saviours, nor a flash in the pan. 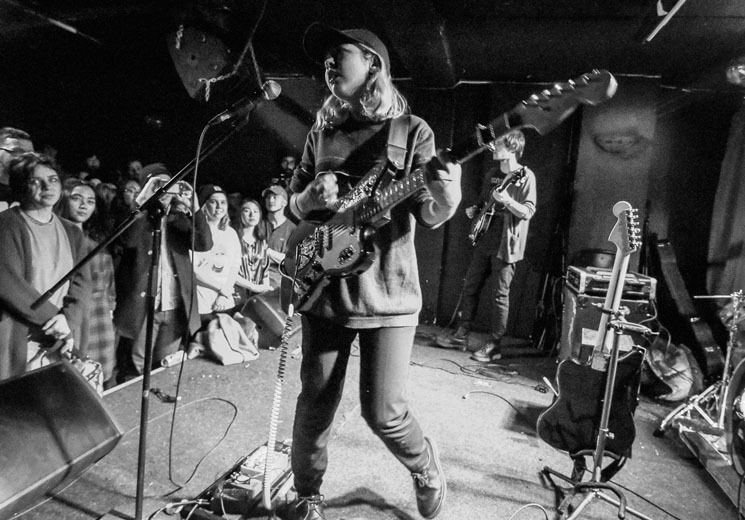 Rather, Snail Mail are a very talented young band taking things one step at a time. ​Snail Mail Covers Courtney Love's "2nd Most Beautiful Girl in the World"